Lost Levels :: View topic - Bio Force Ape is Here! Lost Levels - A website about unreleased video games. 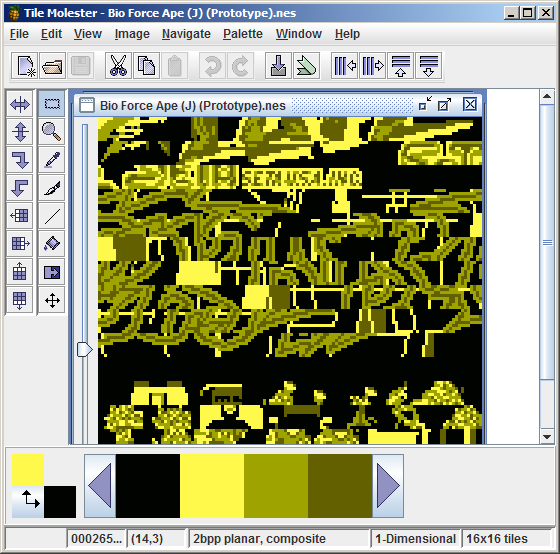 Posted: Fri Apr 01, 2011 3:55 pm�� �Post subject: Bio Force Ape is Here! Ha ha, awesome! I'd been wondering whether you'd be doing this... really is the best possible release date for BFA. The game is actually really fun. I got that feeling from your live stream a while back, but it's nice to really be playing it. I'm honestly kind of surprised that it lives up to the hoax, even without the Butter Monster. Could have been one of those obscure classics, though I suppose in a way it has become that anyway. Edit: Finished, 0"16"51. Strange how the platforming gets so much more difficult for the final stage. First two were easy, just make your way to the exit. Between the teleporters and the conveyor belts, the last stage is pretty challenging! I do wonder whether or not the game is complete. It's playable from beginning to end, and the engine seems finished (that really is some impressive scrolling!) but then you've got oddities like the enemy who only appears once, the sudden jump in difficulty, and the final boss, which is either a joke or unfinished. (I had expected something like Zelda II's Dark Link battle, but no- he stands there, does nothing, you hit him, he dies. ) Is it possible this was put together as a proof of concept? Maybe Seta just threw together the most complete stages into something that would resemble the final product, and changed the record times to match. I don't know. I like it, but I'd like more of it, you know? Either way, fantastic release. Thanks, guys! You know Frank, I just got linked to the new YouTube playthrough video on GoNintendo, and I was actually about to come here to offer you a few rounds of beers or a free lunch or something the next time I'm in SF (that is where 1up is, right?) to get to play the thing, noting that I've pretty much been following your websites since I found FEFEA while looking for NEStacos (and had been following Retronauts independently before you surfaced there too), but I guess you just saved me the trouble? I just got identity theft'd this week, and this actually will really cheer me up. Thanks for this! Offer's still open for free beers sometime though! Noting the irony that some random dude with the screenname "I am Christina Aguilera" is whining about identity theft. I want a beer. come to san francisco please and give me beer. Ah-ha, you have to HOLD A and B as the copyright screen fades out, that sends you to the sound test. It may be a while yet before I travel there, but I will buy you beer when I do. Thank you for making the internet and/or internets more entertaining. I just ripped the NSF for Bio Force Ape a moment ago. Since I released a package of NSFs today as a matter of fact, I mixed it in there and reuploaded it. a very heartfelt thank you for this wonderful piece of gaming history. skrybe.net appears to be down at the moment any chance someone can provide a mirror? Blah, great timing. Here's a mirror. So, I guess I must ask - as complete as this game appears, why would it have been canned? My most immediate assumption would be that there was a requirement for the game to be longer and there were simply no ideas on how to progress it. What a long, strange journey. But now it's finally here. Crazy. Whatever became of the homebrew version, though? I am nowhere near a computer this weekend, can you try to organize someone fixing the link in the article? It's working now. Just a temporary hiccup on my host's end, I guess. I suggest to add both the site download and the mirror. If one is out, there is always the other. I'm just going to put it out there that this has a "Seta USA Inc." in it (maybe just for the title screen for the North American release?). I also saw a text graphic saying "POLICE" but I don't remember offhand seeing it in-game. Otherwise, it didn't seem like there was much in the way of unused stuff. Frank, are you still accepting donations for this? I wanted to chip in something if I could. I was hoping for more of a reaction, but I haven't really had time to look since I had my wisdom teeth yanked out yesterday (xkcd lied, I don't feel like a hologram even though I feel good things about BFA). But I'm glad one lost piece of gaming history is now available to the masses thanks to Lost Levels, and that's it's actually more bizarre than Butter Monster. Twirling and throwing sumo wrestlers by grabbing their gut, hip-hop stick men, guys with crocodile heads for legs. This is the kind of creative mad genius that you can't make up. Awesome write up, Sardius. I couldn't agree more with your closing line. Even if I have to wait five more years, I can't wait to see what's next. Sorry about this but I made a mistake on the NSF earlier. Drag noticed it and pointed it out to me today. I just fixed and uploaded it again. Here you go.